Microsoft Windows DirectX 10 features heavily improved 3D rendering capabilities and several new features to deliver a new generation of visual effects with significantly improved game and 3-D application performance, Sadly, DirectX 10 is officially available for Windows Vista only and Microsoft has no plans to release DirectX 10 for Windows XP, However, guys at "Falling Leaf Systems" ported DirectX 10 on Windows XP starting the project named "Alky" with the aim to provide compatibility libraries for making DirectX 10 work on Windows XP with full support for application development API's, the Alky project is now closed but the source-code is made open-source for further development by community. 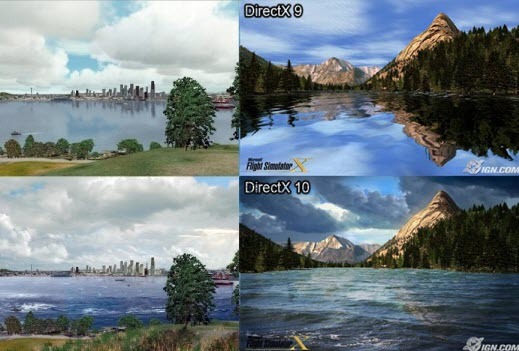 The free DirectX 10 compatibility libraries provided by Alky project allow's developers to create DirectX 10 powered games and applications on platforms other than Windows Vista using Microsoft DirectX 10 SDK and API's, Windows XP users on forums and blogs are reporting successfully using Alky's DirectX 10 for Windows XP to port and play Directx 10 only games like Halo 2 and Shadowrun on Windows XP. You can download Alky's un-official DirectX 10 For Windows XP here, once downloaded simply extract the zip archive and copy the d3d10.dll, d3dx10.dll, d3dx10.dll, dxgi.dll, and Nucleus.dll files to your Windows folder usually C:\windows\system32\. NOTE: This is an unofficial hack of DirectX 10 and might be illegal and harmful to use, this is posted here for educational purpose only - Use at your own risk. do u know why ? or it's my mistake on installing it?? The operating system has to be Windows 2000 or Windows XP with DirectX 9.0 installed. If you want be able to run GTA: San Andreas, the game has to find on your PC the following: 1 GHz CPU, 256 MB of RAM, graphics card with 64 MB RAM and 3.6 GB of free space on the hard disk. These are the minimum requirements. For a smooth gaming experience, Rockstar recommends a Pentium 4 or AMD Athlon XP, 384 MB RAM and a 128 MB graphics card. An Audigy2 soundblaster and a gamepad are also recommended. The full version of the game will require 4.7 GB of free space. Oi not everybody speaks English natively. What he/she wrote would be typical of a Spanish speaking individual who is attempting to be polite by writing here in English. I am so sick of individuals who consider the internet an excuse to drop all effort at wisdom and just mouth off like juveniles on the school bus. Why don't you think first? Why do you give us THAT link? I never download from those guys as I cannot download from their site....common guys, some of us are in darkest Africa...KEEP IT SIMPLE STUPID...? nice it works on xp home edition !!! and ds is safe for real!!! where should i find the origional dix 10 which is 58mb....????? were i dowland directX 10 ???? I m having this error "The application failed to initialize properly (0xc0000005). Click OK to terminate the problem"
My game have 2 launchers..one's for launching using DX9 the other DX10 I only get this error when i try launching it using DX10 even after I installed the above DX10...All I have to do is just extract the files into C:\windows\system32\ right ? Could you please upload it in other site? there must be an easyer way. Most of the downloads are trojans..
how was it differnt ?? Makaseh yu, api sai wat ngerti? I'm Trying to get Direct X for Windows XP. I clicked on the link and went and downloaded the files. I tried to use the program FPSC x10 Which is a mandatory for you to have DX10 for it to be used. do a System Restore and Went to blue screen a couple of times intill I got back hear to post this. Now Normally on DX9 you can use the program but you just can't test maps or do some things. But them things I can't do I REALLY need to do. I don't think the files work and I SERIOUSLY say don't download them. Unless someone can tell me I did something wrong or there is something else that needs to be done. But I did fellow what I was told and all I got was Error's and Blue Screens. This thing f$*kt up my computer. All games work very bad. I don’t recommended to install. just install vista or 7. i want the regular updates because i am a heavy gamer. Haha real funny reading what story this made in the comment section. Works.. but most dx10 games require Vista… you can play the russian version of Cryostasis on XP (vista only) with this fix. I recently installed halo 2 on my xp pc, it works fine, but when I go onto the cmpaign, it doesn't work, it goes as far as the choosing difficulty, but when I choose it, all the options go away and the background is still there. Then it stops the music, and starts again with the choir music, and 5 seconds into it, it stops and restarts the background animation and restarts the choir music and into it another 5 seconds it stops and does the same thing. IT DOES THAT FoREVER until I press esc or backspace Which takes me back to choosing difficulty. Please tellme if getting directx 10 would fix this. Does it really works?well, actually i try to install it first.Then it really appears in my dxdiag that i had a directx10.But when i try to run the game it says directx10 not installed.Hows that? Do your research ladies and gentlemen! Microsoft DID NOT publish directx 10 & 11 for XP. If they did, they would lose sales in Vista and Windows 7. Only thing left to do is actually buy =(. It doesn't work on my pc. I have installed it in my PC. It has great features for 3D Renderings but When a DirectX 10 application runs on a Windows Vista-based computer that has multiple graphics cards, the computer does not use the secondary graphics card. The Dx10 download files were taken offline by RapidShare "File Not Found" is the error you get if you attempt to download it. I had to go to the pirate bay in order to get my copy of Direct X for Windows XP.